Founded in 2006, Emerald Coast Scuba joined hands with Coach Mary. Coach Mary is the Aquatics director for the Seamint Pond. She started her career as a swimmer in her childhood and has swam competitively throughout college. She has a Masters degree in education, and has been teaching swimming in the Destin/FWB area since the 90’s. Coach Mary and her staff are recipients of the “Best Swim School” in the region since 2008. Come join her for fun in the sun at Emerald Coast Scuba. Coach Mary – Our Aquatics Director at Emerald Coast Scuba. Coach Mary is without question, the best swim coach in the SouthEast! She swam her way through college earning her Masters degree in education, and how she applies this training to her swimming lessons is truly magical! She is the unofficial “kid wisper” of the swim world. Although Mary is a certified diver, she is most at home in the pool, working her magic on the children of the Emerald Coast! You are truly lucky to have your child spend some time in the Seamint Pond with the one and only – Coach Mary! Registration can be done in person as always, OR try our brand new ONLINE registration! ONLINE is best for the parents who are certain that their child is in the right class. If you have any questions about which class your child should be in - then please call us or come register at the shop and we will steer you in the right direction. Emerald Coast Scuba is proud to offer Group Lessons. Our aquatics director, Coach Mary, has designed a program that caters to every child’s individual needs. 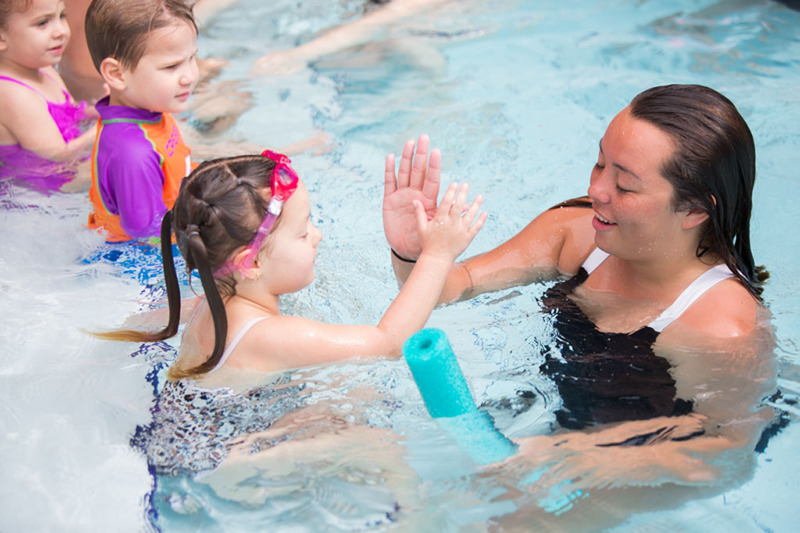 These lessons are structured to promote familiarization with the water, safety in and around the water, correct stroke technique and stroke development; all in a safe and fun environment! All of our instructors are lifeguard certified and have trained under Coach Mary for multiple seasons, before gaining their own station. The Dolphins class is for swimmers ranging in age from 6 months to 3 years. This class starts as a base for acclimation to the water, life saving skills and progresses to basic swimming skills. This class has 3 levels, so children will be divided by ability. Parents are in the water learning how to work with their little swimmer on the skills. The Sharks class is for swimmers ranging in age from 6 to 12 years. This class focuses on teaching good swimming technique, and stroke development. The Stingrays class is geared towards Pre-teen and adults. This class ranges in its experience level, from someone with little to no swimming ability, all the way to training for long distance swims or all around technique improvement.